Just as enjoyable as the cask version and the last ale from our Easter getaway. Not as fruity as their description might suggest. 4.2% A.B.V. I like a nice rich ruby ale for a change and was really looking forward to this. The colour was great, but sadly it was almost completely flat. I’m sure that wasn’t the intention and I look forward to trying it again when the opportunity arises. 4.8% A.B.V. May 2016. After sampling the excellent Wold Top Bitter on our stop in North Yorkshire I was delighted to spot another of their beers on the shelf of a supermarket in Ripon. This didn’t disappoint either - a ‘proper’ IPA and at 6% A.B.V one to be savoured rather than sloshed back. May 2016. Clearly not one to waste words, but it adequately sums up this tasty stout. Staffordshire? Well, yes, we stayed in the Peak District but parts of it we travelled through on the way to our site were indeed in Staffordshire and this was bought at the Co-Op in Bakewell. The last of my selection of ales from Askrigg was probably the least enjoyable. Not because it wasn’t good but because the bar had been set so high by the others which were simply more to my taste. A great ale for those that like a golden hoppier beer. 4.3% A.B.V. What they say? Well, nothing as usual and searching on the usual suspects - www.perfectpint.co.uk, www.ratebeer.com, proved unproductive. However, what we have is another mighty fine ale from the gang at Askrigg. An amber coloured bitter hitting all the right notes for me, striking the right balance between, malty, fruity, hoppy and bitterness. 3.9% A.B.V. So! Nearly three weeks after our Easter getaway ended I'm up to date with the draught beers that we got to sample on our travels. Now it’s just the few remaining bottled ales that need my attention…. Ok, so there’s a lot of what could uncharitably be called twaddle in there, but I like Whychwood’s whole tongue in cheek spooky thing going on. More to the point I’ve liked every single on their beers I’ve tried and this was no exception. Another quality brew from Oxfordshire. 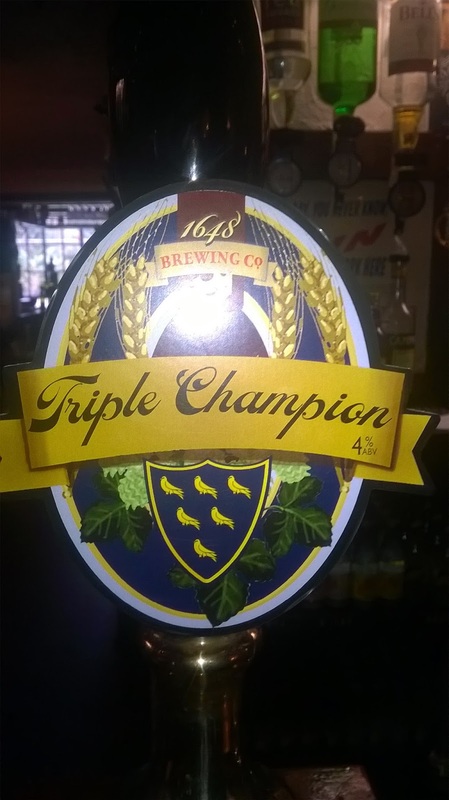 From the Fullers Stable comes this latest guest in our local and a lovely pint it was too. I didn’t find it as fruity as the description suggests. 4.0% A.B.V. What they say: "Triple Champion 4.0% abv. Deep chestnut, old fashioned English bitter with a rich malty back taste"
Our first beer back in the ‘local’ on return from our Easter getaway and very tasty it was too. Yes, it was an old fashioned bitter but that’s just fine by me. Brewed just up the road in Dorking from our campsite in East Horsley. Thankfully, the aforementioned hint of citrus fruits was subtle. I really enjoyed this, and have the bottled version to sample at some point too. 4.2% A.B.V. Our final stop on our Easter getaway saw us in East Horsley in Surrey and if we ever needed reminding that we were back down south, the cost of a couple of pints provided it! That being said, this - our first pint was delicious. A dark malty bitter weighing in at 4.1% A.B.V. I have no idea who actually brews it, and have asked the pub via the wonders of social media if they could let me know. If and when I get a reply I’ll update this entry. Yeah, I like this, but then I’ve generally enjoyed red ales. The citrus aroma didn’t overpower or put me off. Sadly the last beer we got to sample during our time in the Peak District. 4% A.B.V. From not too far away - in Glossop, this was another guest at the good old Pack Horse Inn.